Trump's economic plans: What do we know so far? 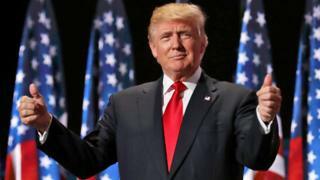 Donald Trump says he will not delay "making America great again" - and the new US president has already begun unpicking some of his predecessor's policies, including Barack Obama's signature healthcare system. The most controversial part of President Trump's move was to freeze regulations concerning President Obama's Affordable Care Act, nicknamed Obamacare. It's still not clear what this will mean for individuals who have taken out insurance or the private insurers covering them. But the new president has vowed to "repeal and replace" the scheme. As for the other legislation that's been put on hold, it will now be "reviewed". But there's likely to be more to it than that. Trump cabinet member Wilbur Ross suggested last year that cutting regulation would save business $200bn (£161bn) annually. He singled out restrictions on health and safety and the coal industry as ripe for repeal. If President Trump has made one thing clear it's that he believes current international trade arrangements "put the interests of insiders and the Washington elite over the hard-working men and women of this country" as the White House website now states. The president said on Sunday that talks on renegotiating Nafta, the free trade pact that has been in place since 1994, would be starting soon with the leaders of Canada and Mexico. He said the talk with the Mexican president would also cover immigration and border security - a nod to his pre-election promise to have a wall constructed on the southern US frontier. We may also see this week the first concrete moves when it comes to unravelling the Trans-Pacific Partnership pact. That's the trade deal that Mr Obama spent years negotiating with Pacific Rim nations from Japan to Chile, part of his "pivot" towards the Asia, designed to counter China's growing power. Big American banks have enjoyed a good few months since the election. That's one of the sectors hoping that a cut-back on red tape will give it more room for manoeuvre. Steven Mnuchin, the likely Treasury secretary, has vowed to soften "Dodd-Frank" - the new rules brought in after the 2008 financial crash to restrict what big banks can do. And that could mean bigger profits on Wall Street. Mr Mnuchin is not officially in office yet, and that's the kind of change that may well take some time to get done, but it hasn't stopped bank chiefs talking in sunny terms about the future under President Trump. More immediately - in fact within an hour of the new administration taking over - there was a block on a late-in-the-day Obama policy that would have helped reduce the cost of mortgages for millions of homebuyers. Republicans had already expressed concern that it would be a drain on the mortgage insurance fund. Heading the list of "top issues" on the overhauled White House website is a new "America First Energy Plan". Mr Trump wants untapped shale oil and gas reserves to be exploited. And he wants to see America's "hurting" coal industry fired up again. It's the revenues from shale that will go into the promised infrastructure programme - building roads, schools and bridges. Climate change - a central plank of the Obama administration's policy strategy - has been erased from the site. The environment does get a mention: the Environmental Protection Agency will now focus on "its essential mission of protecting our air and water". The White House website paints a sorry picture of the American economy under this heading, pointing to manufacturing jobs that have disappeared and a "slow" recovery since 2008. It says Mr Trump has a "bold plan" to create 25 million new American jobs and return the country to 4% annual economic growth. The way the new president plans to do this is by lowering tax rates across the board, including for business. It's not yet clear how those tax cuts will be financed. Although the new administration sees a country in sore need of an overhaul - in his inauguration speech President Trump painted a picture of "American carnage" - of families trapped in poverty, and "rusted-out factories scattered like tombstones" - the new president has actually inherited an economy that is overall considered to be in pretty good shape. There have been 75 months of consecutive job creation, official unemployment stands at 4.7% and the economy is growing steadily. Thus far investors seem to be keeping in mind the catchphrase of an earlier president, that the biggest danger is negative sentiment. Market indexes rallied after Mr Trump's election and have now paused for breath as traders wait to see what happens. And that's not to be sniffed at: positive expectations are a significant asset for an incoming president with radical plans.